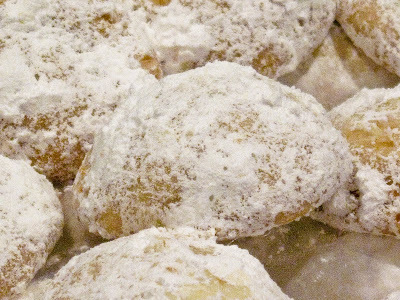 Growing up, wedding cookies were always present in our Christmas cookie tins. I did not like them–I wonder if they are a taste you need to mature into, because I adore them now, while my kids in turn do not care for them. Karma–what are you going to do? Anyway, my mom uses Rose Levy Beranbaum’s recipe with pecans, and they are fantastic. However, and I am sure I am a trial to my mother who adores traditional family recipes, I wanted to try a recipe in my current favorite cookbook, Chewy Gooey Crispy Crunchy Melt-in-Your-Mouth Cookies by Alice Medrich , and I wanted to try a nut that got me more excited. I also went looking for a different recipe because I wanted a recipe that specifically allows for using whatever nut you want, and Medrich’s does. My favorite nuts are hazelnuts, but I happened to have a can of Hawaiian macadamia nuts (roasted and salted) and I thought their rich yet also airy texture might be fantastic in a wedding cookie. Medrich’s recipe calls for a lot of nuts and very little sugar (in the cookie dough), giving the nuts a starring role. They did not disappoint–and I cannot stay out of them. Sub any nut you like–Medrich does not mention whether they should be toasted first, raw, roasted, etc, so I say go with your gut. The macadamia nuts I had were already roasted and they worked fine. One note about the mixing method: Medrich’s book is full of alternative mixing methods, i.e., food processor, stirring in a pot, etc. I am so used to always just using my Kitchen Aid mixer, so this was a change for me. And a reason that I am now searching for a bigger processor because doubling the recipe gave me fits–so I finished in a mixer. They came out fine, but I only switched to the mixer to add the nuts in, no sooner. Either line your cookie sheets with parchment paper or leave them ungreased. Set aside. Fit your food processor with the mincing blade. Pule the nuts until half of them look pulverized and the rest look chopped. Move the nuts to a bowl and wipe out the food processor to remove the excess oil from the nuts. Put the granulated sugar into the processor and process until it is fine and powdery. Add the flour and salt and process to mix. Add the butter, vanilla and egg yolk. Process until the mixture looks damp and begins to clump. Add the nuts and pulse until combined. Place the dough in a bowl with a lid and cover the dough with wax paper, pressing it into he dough. Put the lid on the bowl and chill for 2 hours or, even better, overnight (I did overnight). The next day or when you are ready to bake, preheat the oven to 325 F. If you will be baking 2 sheets at a time, place the racks in the upper and lower thirds of the oven. 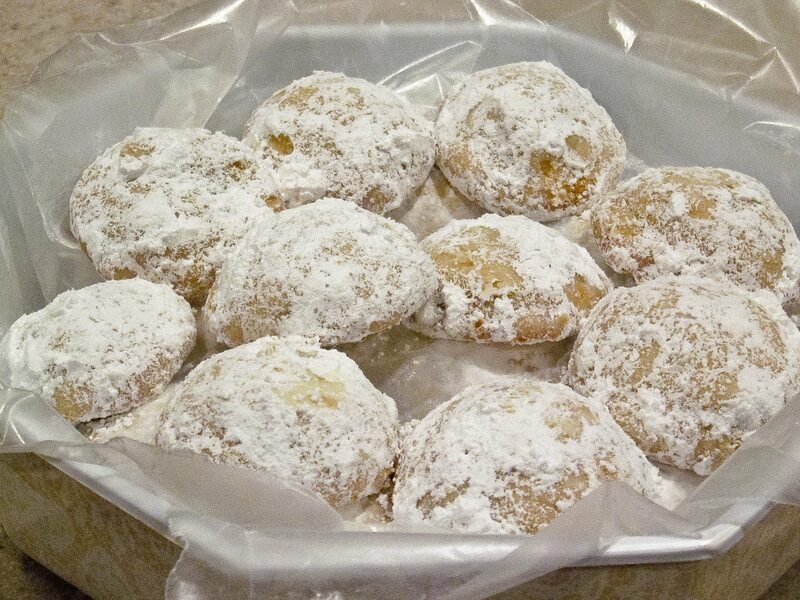 Shape slightly heaping tablespoon balls of dough into balls (Medrich says you can also do crescents). Place the cookies 2 inches apart--do not do more than 12 cookies per sheet, I tried the first time and the cookies definitely spread more. Bake the cookies for 22-24 minutes, or until "lightly colored on top and golden brown on the bottom." Rotate your pans top to bottom and front to back halfway through to ensure even baking. Let the cookies cool on the pans for 5 minutes. Then sieve powdered sugar over the tops of them and let finish cooling. 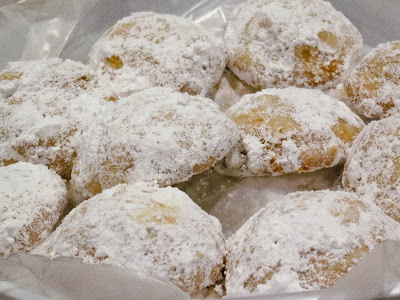 When the cookies had mostly cooled, I also gently shook them in a bag full of powdered sugar (requiring more than the half cup) because I like a wedding cookie that is coated in powdered sugar more thoroughly. Cool cookies totally before storing. These cookies store well except for the fact that the powdered sugar will absorb moisture. Sieve additional powdered sugar over them before serving if that happens. Affiliate links were used in this post, but only to link to items I would be discussing and linking to in any event. This is so interesting. My husband's mother didn't bake much but she made GREAT Mexican Wedding cookies and we called them snowballs. I haven't yet found a recipe that tastes just like hers – a little bit crunchy and just plain yummy. I wonder if she used macadamia nuts?! She was from Hawaii! I am going to have to try this. So interesting. Thanks for a great post. wedding cookies are one of my faves! these sound so to die for! These are such lovely wedding cookies! I never make these…on purpose…because I cannot stay away from them. My kids wouldn't get a chance to even see if they liked them because I would have eaten them all straight out of the oven. The macadamia variation sounds just as wonderful. These are my all time favorites as I wrote about last week. So many different names too! I love wedding cookies! 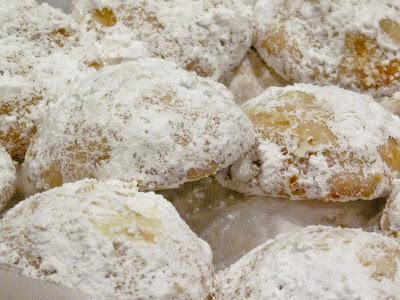 These look a lot like the Russian tea cakes my wife makes for Christmas each year. But the best part for me is using mac nuts! Mac nut cookies are always a hit in my house. Me too love wedding cookies! They look beautiful. Informative post and enjoyed the captures you took of your baked goodies. I love these cookies ingredients! I cant wait to try them!